The No. 1 Store for Graduation Stoles/Sashes Welcome to TasselnFringe- GraduationProduct.com! 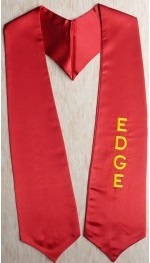 Your online store for custom graduation sashes. 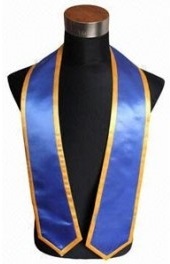 Custom school, graduation, and graternity/sorority sashes and stoles we offer standard length graduation stoles designed both to be worn with a traditional graduation gown. All of our graduation supplies, including stoles and sashes are available in bulk or as single purchases by individual students. Our stoles are made of the highest quality materials and make grads look great! Don't risk buying a cheap graduation stole. We guarantee that our stoles will look great. You can know that you are getting the very best when you or your students purchase their commencement stoles from Honors Graduation! Personalize your Own Sash /Stoles. Beyond graduation sashes, we also make custom sashes for company awards, pageants, homecomings or ceremonies, as well as pillows. All of our sashes are made with bridal-quality satin, and can be customized to perfectly match your colors. If you think you can beat a rate you found on our website, call us, we'd love to talk to you! To purchase product(s), CLICK "add to cart".When the correct number of items that you want to purchase is in your basket, simply click on "My Cart Postioned on the top of the right side". And Many More Colors Available !! Text on left and right side of stole. Click HERE to view our NEW one color imprinted stoles. When Should I Order My Graduation Stoles or custom stoles ? If you are graduating in April, May or June, you should order your graduation stole now! Many students across the nation have already placed orders for Spring2010 commencements. For standard orders, our production time is 1-2 weeks, plus 3 days for shipping via FedEx. If you need your graduation stoles more quickly, rush orders can becompleted within 4 business days, plus 2 days for shipping via FedEx Express or Priority. At GraduationProduct.com, we pride ourselves on providing outstanding products at guaranteed lowest prices, with customer service to match. Weunderstand how important your graduation is, and will work hard to exceed your expectations.